Designed for orienteering and accurate navigation, the Brunton 15TDCL mirrored sighting compass features orienteering lines, adjustable declination, protective cover with sighting mirror and more. Brunton 58 Kayak is the dream navigation tool of any kayaker. Never wet your feet again without knowing your exact navigation path with confidence that you will be able to maintain that path. This d built to last kayak compass is completely waterproof and provides you with the confidence you need to tread any waters. Brunton 58CE is a competition-ready rally compass that mounts to your car, truck or boat dash to show your heading at a glance. Pre-wired to tie into your lighting system and illuminate when you click on your lights. This could be the difference between winning and ending up lost. The heavy duty rugged design makes this the best car compass. Part of the Eclipse family, the 8097 is designed to take map reading a step further. It features 1:24 USGS and UTM scales. Our patented circle-over-circle alignment system makes quick reading possible and the map magnifier brings map details in close. Brunton's Eclipse 8099 Pro is an all-in-one professional compass that serves as both a baseplate and a mirrored sighting map compass. Designed for easy-navigation, the 8099 features three clinometer systems and our patented circle-over-circle alignment system. Includes field reference cards for mapping and emergency skills. The Brunton 85R is made for the water, our marine compass features a direct reading disk and mounts to any dash or surface. Highly stable, the 85R fits in small less speedy motorboats, sailing boats, rowing boats, canoes and surf-boards. Permits 25 degree of heeling. A lighter-weight version of the vintage metal 9077, this compass has the classic Lensatic look, feel and function. Molded high-impact plastic body with a locking lid that doubles as a thumb-steady sighting aid. Brunton Nomad G3 Pro is the evolved version of its proven predecessors. The ultimate in weather prediction and digital navigation, the Nomad G3 Pro delivers temperature, altitude, and barometric pressure, plus compass bearing, daily alarms and exercise pacers. Brunton Nomad V2 Pro is the ultimate digital navigator/weather center. This digital dynamo offers compass bearings, direction readings and is even declination adjustable. The 70M is the re-evolution of the award-winning Eclipse 8099. Still featuring the three clinometers system, combined clear base plate for mapping and mirror for sighting, and a round level bubble for more accurate measurements. Yellow protective rubber cover for the Brunton ClinoMaster and SightMaster series clinometers and sighting compasses. The RP2 vehicle compass includes digital compass, dual zone car thermometers with Ice Alert. Directions are displayed in cardinal points as well as numerical degrees read out. The RP2 has a built-in temperature sensor for inside your vehicle and comes with an additional sensor for the outside temperature measurement. 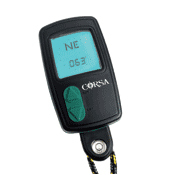 The Corsa x473 digital handheld compass is rugged and reliable navigational tool for outdoor and marine use. This advanced Corsa x473 model includes display backlighting, bearing point feature and detachable bubble level. The Full-Spectrum temp sensor is compatible with any V2020 wireless temperature & compass system, allowing you to fully utilize your unit with both outside and inside temperature readings. Wayfinder has designed a new wireless bicycle compass from the ground up. Using patented digital technology, the Wayfinder B110 compensates for the magnetic field of your bicycle, ensuring maximum compass accuracy regardless of bike model and its magnetic interference. Simple-to-use yet powerful navigational tool that works in any car, truck, RV, or SUV. Displays compass readings with 8 cardinal points in large letters. Beautiful full-featured digital compass with thermometer, for use in all vehicles. Displays 3 compass readings with bearing point memory, as well as a temperature reading with ICE alert warning. New totally wireless temperature/compass system with Full Spectrum all- weather performance. Accurate compass and outside temperature readings on a large, crisp holographic display. Digital compass that automatically switches between vehicle and hand-held use. Use it for hiking or driving. Displays 3 compass readings on a bright backlit screen. For those seeking the best. Full-featured digital compass system for all vehicles with thermometer, altimeter, barometer, and weather forecaster. Sleek metallic- finish design. Combining two proven field tools into a single aluminum housed instrument, the SUM360LA fills the need for a do-it-all instrument. The Brunton ClinoMaster CM360LA height meter/clinometers represent the highest quality in precision sensitivity and durability. Brunton SightMaster SM360LA sighting compasses offer the convenience of two compasses in one as a hand held unit, or as a sighting model. The World's Best Compass from Brunton is a composite body compass, made durable for reliability and extremely resistant to magnetic interference. Using a rare earth magnet, Brunton F-WBC is resistant to magnetic interference and depolarization. Silicone sealing ensures weatherproofing so you can use your compass anywhere in the world. This monopods quick set-up makes it favorite for lightweight packers who use binoculars, scopes and cameras. Its also sturdy enough to be used as a walking stick.